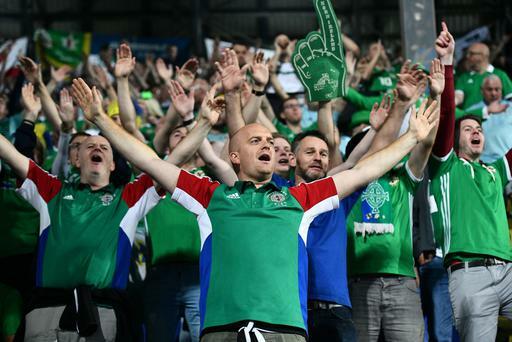 Northern Ireland's GAWA travelled in numbers to Bosnia and are likely to do the same when their side take on Holland in Rotterdam. Press Eye - Belfast - Northern Ireland - 14th October 2018 - Photo by William Cherry/Presseye Northern Ireland fans during Monday nights UEFA Nations League game against Bosnia & Herzegovina at the Stadion Grbavica, Sarajevo. Press Eye - Belfast - Northern Ireland - 14th October 2018 - Photo by William Cherry/Presseye Northern Ireland fans inn Sarajevo ahead of their UEFA Nations League game against Bosnia & Herzegovina at the Stadion Grbavica. Press Eye - Belfast - Northern Ireland - 14th October 2018 - Photo by William Cherry/Presseye Northern Ireland fans Steve Steele and Owen Sheppard in Sarajevo ahead of their UEFA Nations League game against Bosnia & Herzegovina at the Stadion Grbavica. Press Eye - Belfast - Northern Ireland - 14th October 2018 - Photo by William Cherry/Presseye Northern Ireland fans Sam Cummings, Aaron Stevenson, Ryan Myles and Ryan Taylor in Sarajevo ahead of their UEFA Nations League game against Bosnia & Herzegovina at the Stadion Grbavica. Press Eye - Belfast - Northern Ireland - 14th October 2018 - Photo by William Cherry/Presseye Northern Ireland fans Stephen Lynch and Samantha Riddles in Sarajevo ahead of their UEFA Nations League game against Bosnia & Herzegovina at the Stadion Grbavica. Press Eye - Belfast - Northern Ireland - 14th October 2018 - Photo by William Cherry/Presseye Northern Ireland fans Jenny and Emma Gillespie in Sarajevo ahead of their UEFA Nations League game against Bosnia & Herzegovina at the Stadion Grbavica. Press Eye - Belfast - Northern Ireland - 14th October 2018 - Photo by William Cherry/Presseye Northern Ireland fans Hayden Davis, Michael Ferguson and Mark Porter in Sarajevo ahead of their UEFA Nations League game against Bosnia & Herzegovina at the Stadion Grbavica. Press Eye - Belfast - Northern Ireland - 14th October 2018 - Photo by William Cherry/Presseye Northern Ireland fans during the UEFA Nations League game against Bosnia & Herzegovina at the Stadion Grbavica, Sarajevo. Press Eye - Belfast - Northern Ireland - 14th October 2018 - Photo by William Cherry/Presseye Northern Ireland manager Michael O'Neill before Monday nights UEFA Nations League game against Bosnia & Herzegovina at the Stadion Grbavica, Sarajevo.